Democrat Bernie Sanders is surging lately... in t-shirt sales. 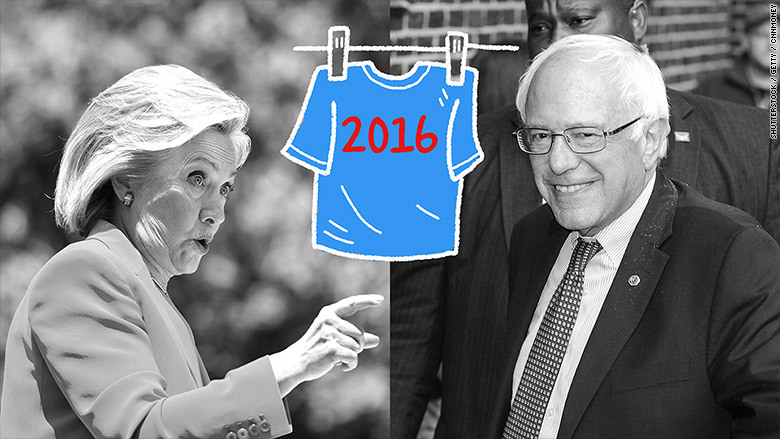 More people are buying shirts, hats, mugs, bumper stickers and baby onesies with Sanders name than the gear of rival Hillary Clinton, at least according to online retailer CafePress. The website has been tracking sales of souvenirs for all the 2016 candidates. So far, CafePress has sold 19,132 Sanders products and only 17,276 Clinton ones. The site has correctly predicted the past three presidential elections based on its sales data. 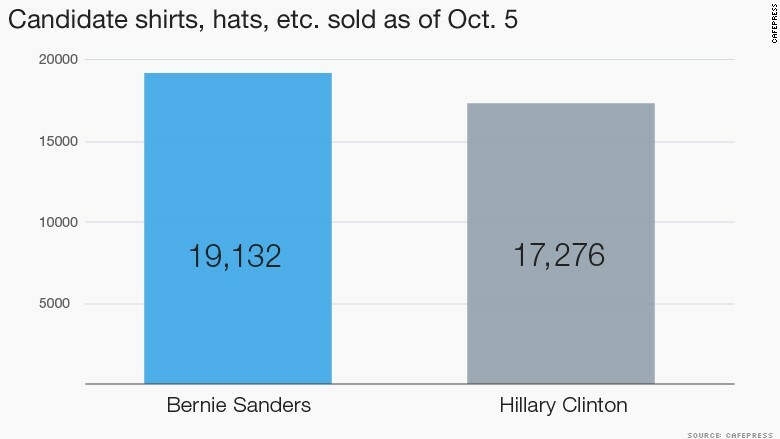 In a worrisome sign for Clinton, she was leading Sanders on gear sales until mid-September. Then Sanders began to pull ahead -- right around the time his poll numbers started to close the gap with Clinton, especially in the key states of Iowa and New Hampshire. The slogan "Feel the Bern" has especially caught on. But both Democrats lag Republican Donald Trump, who is by far and away the bestseller on CafePress, with over 26,000 campaign items sold. Ben Carson is a distant second. Trump recently sent a "cease and desist" letter to CafePress asserting that he owns the trademark rights to his slogan "Make America Great Again." The site has taken down items with that specific motto, although it still offers many other Trump branded products. On the CafePress site, customers can order from pre-made campaign designs or they can create their own. The proceeds from the sales do not go to the campaigns. A spokeswoman for the site confirmed they are ready to track Joe Biden items if he enters the race. They update their sales data on the 2016 candidates weekly. While Sanders is enjoying a "shirt surge," he is still trailing Clinton by a substantial 18 points in the latest polls. The Democrats will face off against each other Tuesday night in the CNN debate in Las Vegas.